Margaret wants to see her student's running total points and the letter grade based on the running total. By default, every course shell comes with two grade columns: Total and Weighted Total. Margaret will modify the Total grade column in order to see the points and letter grade (either could be used). Click the chevron next to the word Total. 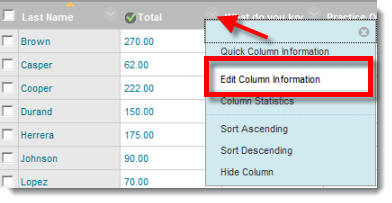 In Section 1 of the Modify Total Column screen, look for Primary Display. Choose Score from the drop-down menu..
For the Secondary Display, select Letter from the drop-down menu. In Section 3, look for Calculate as Running Total. Select Yes. Keep in mind that students ONLY see the primary display; in this case, the score. * Caution -- Running Totals can be dangerous! Be very careful with running Total and running Weighted Total. At the end of the semester, turn running Total and running Weighted Total to NO. Otherwise, if a student has missed an assessment or failed to turn in an assignment and does not have a grade for that item in the Grade Center, the student's total score will be higher than deserved. If you decide to use running Totals at the end of the semester, you must enter a grade of 0 for any missed item. 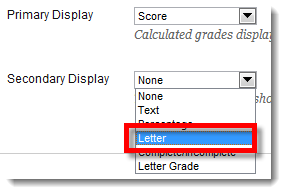 To adjust your letter grade point breakdown, go to the Grade Center and click Manage. Select Grading Schemas. Click the Modify button next to the word Letter and follow the instructions. or read Setting Up the Grade Center: About Grading Schemas.